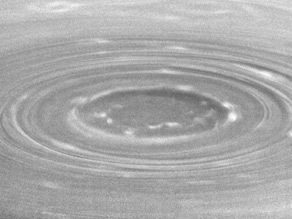 Check out these new Cassini pictures of the vortex at Saturn's southern pole. Vortex at Saturn's southern pole. Image: NASA/JPL/Space Science Inst. The new images, captured in July, are ten times more detailed than any taken before of this phenomenon. Experts say the vortex is not unlike a hurricane here on Earth...except it rages all the time, and it is anchored to the pole. And it is much larger than any terrestrial storm, about the diameter of the Earth itself, with wind speeds nearing 350 miles per hour. Like a hurricane, the vortex is awash in convective atmospheric turnover, with warmer gases being pumped up and away from the interior. A detailed image of the eye itself show smaller storms within it...in previous images these just looked like puffy clouds. Scientists are interested in studying this vortex because it will help them better understand the dynamics of Saturn's atmosphere. It's yet another fascinating target for Cassini as it continues its tour of the Saturn system - the rings, the moons (especially Titan, which is often compared to the primordial Earth, and the geyser moon Enceladus), and these intriguing weather systems. Maximized greenhouse, only to be vacum cleaned, not eenough emitters ? How manyTropopauses has Saturn got ? Each gas cloding out at it's temperature destined height. NHC is recommending a mandatory evacuation. ... if you zoom way in you can almost make out my beach house. This is really interesting example of the greenhouse effect. On Earth, one Tropopause, Clouds cannot rise above. Higher up, CO2 does not form clouds. Mars is even poorer, No clouds has the thin atmosphere. "could God be making another planet"
Hold thy tongue Franko, Itelligent Design has been outlawed by the courts! Anyone have a lawful hyothesis what caused that large hexagon structure to form around Saturns N. Pole? Disclaimer: This comment is the result of a very long sequence of random chemical reactions. What is the economy doing to people's brains? Or maybe this is normal for Americans these days? Anyways, I'd like to thank Larian for that wonderful comment and the link to the Bad Astronomer blog. I hope that in the possible Extended-Extended Mission, Cassini will be put in a tight orbit between the rings and clouds of Saturn (of course elongating outwards so that it has enough relative velocity to not be "sucked in"). As to a theory, sadly I am not a Exo-terran meteorologists, so I got nothing on it. Saturn is a pretty strange place to start with. For instance (to use a particularly bad analogy) if Saturn were of uniform density, and you could find a bathtub big enough, the planet would float on water! If ID is true in any form or fashion, it most likely takes the form of a young scientist and his experiments. When he accidentally created a powerful, yet tiny explosion (akin to a firecracker exploding) he probably said something to the effect of "Oh sh.." and watched as the chamber filled with a new Universe. Or maybe it's all a magnificent computer simulation and this is just a holographic universe. I doubt it is anything as mystical as a huge freaking hand throwing a lighting bolt and saying "Let there be light!" And he saw the it was good so he made planets and all that jazz. Nah... doubt it. But this is probably no place for a religious debate. "It is sometimes argued by those who seek harmony between the two camps that faith and reason — religion and science, dogma and skepticism — are simply two different ways of knowing. I disagree. Faith reserves the right to suspend logic, and from there, no progress or understanding is possible. If P and ~P are both true, we know nothing. Our goal, therefore, should be to show not that any particular religion is wrong, but that all dogma-based approaches to life are nonsensical and harmful. Besides, it is probably easier rhetorically, pedagogically, and socially, not to mention less confrontational, to get a dogmatist to see that emotions are ineffective in solving physics problems than it is to convince a theist that the Bible has nothing useful to say about molecular biology. And yet, the first lesson ultimately leads to the second." Not Even Totally Wronged, computer model. Does there appear to be a dark monolith at the center of the vortex with dimensions of 1x4x9? Earth is relatively simple, Tropopause wrings out the water. A few bats, gorging on insects, creating unusual rain droplets. Occasional flying pink pig with lipstick, but no flying elephants. Saturn has many phase changes, chemical and atmospheric interactions. I think its absolutly incredible how far we have come in technology and photography, that we are able to research these other planets and other new things about the earth. But could life have another working fluid, not H2O, but NH3 ?